Huddersfield Town are aiming to edge further away from danger with a positive result against Cardiff City at the John Smith’s Stadium on Saturday. The hosts are in 14th place in the Championship table with 38 points but are only eight points above the relegation places. Chris Powell’s Terriers are on a run which has seen only one win in four games and three defeats out of four on their own turf. The visit of 15th placed Cardiff comes at a good time, the Bluebirds are without a win in seven games and have won only once at HD1 since 1959. That said, Russell Slade’s current side have lost only once against the Terriers in their last seven meetings but remain in the relegation dogfight and only a point worse off than Town. 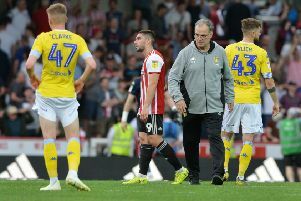 It will be a meeting of old friends as Lee Peltier returns to the club he left in January while former Town loanee Sean Morrison is set to line-up in the Bluebirds’ defence. Mark Hudson scored the winner for Cardiff on the opening day of the 2012-13 season against Huddersfield, he will skipper the Terriers on Saturday as they look to avoid a third straight home defeat. Joel Lynch will miss the visit of the Bluebirds, Powell confirmed the defender has not recovered from injury in time to play.